Sometime between 1834, when James Gamble laid out the first town lots and 1853, when Shelby was incorporated as a village, there started an era in which certain draperies, rugs and bed coverings were manufacturered by weavers located in our area. Their products varied in design and intricacy, but their durability was outstanding and although it has been over 165 years since many of these items were woven, their beauty and designs continue to please the eye and their condition is often amazingly good. The bedcoverings were called counterpanes or coverlets. The 1850 census in this area reveals some interesting facts that pertain to weaving. There are individuals who list their occupation as weavers, rug weavers, coverlet weavers and coverlet makers to name several. In 1850, the occupation of "weaver" could denote several types of weaving. The use of a portable table or floor loom allowed the manufacture of bed coverings, rugs, etc. of a simple or random pattern. This loom was easily portable and could be moved from community to community with little effort. The production of woven floral or geometric patterns required a more sophisticated and less portable loom. Prior to 1800, a patterned woven bed covering or drapery was produced on a draw - loom (of various types) that enabled certain specific woven strands (warp) to be raised or, less frequently, lowered in relation to the remaining strands of warp. The weaver's shuttle with the single crosswise running strand (weft) was passed through these "warped" strands and pressed against the previous weft strand. Another grouping of warp strands were then selected and raised (drawn) and the shuttle with the weft strand was again passed and in this "one at a time" manner, the desired pattern was made. This was an intricate and time consuming operation and nearly impossible for a single operator to accomplish. For that reason the weaver usually employed a boy 12 to 18 years of age who usually sat atop the loom to "draw" up the correct selection of warp strands and allow the weaver to operate the loom and shuttle. A good combination of weaver and "draw boy" could complete up to 1 to 2 weft strands a minute depending also on the complexity of the design. An examination of the number of weft strands per inch indicates how much time is involved in the making of a woven patterned coverlet. This time does not include any changing of strand colors. In 1728 Lois (or Jean) Falcon first used a card with punched holes and a specially designed device mounted on top of the loom to aid the loom boy in the process of drawing up the warp strands. The loom boy selected the correct card and held it against a surface that controlled the rods that he previously had used to raise the proper warp strands. The position of the holes in the punched card "selected" the proper strands of warp to be drawn up and the shuttle could then be passed. Another punched card was selected and pressed against the surface and another pass could be made by the shuttle. The cards were chosen in the proper sequence and the desired pattern was made. This process was an improvement; however, it still required two people to operate the press and didn't increase production a significant amount and so it never got much beyond the prototype stage. Jacques de Vaucanson in 1741 designed a metal cylinder with a raised patterns of pins (in the manner of the cylinder- playing music boxes that were popular during that period) that he used to control the draw rods and therefore create a pattern. The major problem with the de Vaucanson loom was that it was difficult and expensive to manufacture the cylinders which had to be created for every pattern and it meant that once the cylinder was created, the pattern could not be varied without another completely new cylinder. It's use was not wide spread and it was soon abandoned. In 1804 Joseph Jacquard patented a system that used the punched cards and a special loom attachment as did the Falcon machine. However, the Jacquard loom made use of a continous loop of punched cards that automatically advanced with each pass of the shuttle. There was no further need of a "loom boy". Once the card loop was designed for the particular pattern that was desired and the cards were correctly assembled in an endless loop, the entire weaving process could be handled by the weaver alone. The Jacquard Loom greatly increased productivity (by a factor of 10 to 25 times) and allowed for increasing complexity in the design. If it was desired that the design pattern be changed somewhat, some of the cards could be changed, or additional cards added, the design changed and the work could continue. Generally the cards were not made by the weaver, but purchased from a card designer. From a closely drawn (and enlarged) example of the desired finished product, the card designer took measurements and punched the card blanks in the proper locations. A blank card has a space corresponding to each warp strand. A hole punched in any of these locations allowed that strand to be selected. Therefore each card in the series had the status of each warp strand (raised or not) for each weft strand in the pattern that was to be produced. This system was extremely successful. It was inexpensive to produce the cards, extremely flexible, simple to change from one pattern design to another and most of all, it greatly increased the weaver's productivity. Among those who were greatly impressed with the Jacquard Loom was Emperor Napoleon, who visited Jacquard's workshop in Lyons, France in 1805(1). The Emporer issued a decree that Jacquard should be compensated for his contribution to the French Society and bestowed on him an annual pension. Jacquard died in 1834, but his punched card system lived on in the life of Charles Babagge (born 1791). Babagge had struggled for years to complete his invention of the "difference engine", a machine to mechanically "compute" numbers for use in compiling mathematical tables. In 1836 he saw how the punched card system used in the Jacquard loom could be used in his newest idea the "Analytical Engine". The punched card system in Babagge's Analytical Engine has been long regarded as the forerunner to the IBM punch card reader and our modern day computer. The Jacquard Loom attachment was imported into the United States by the 1820s and by the 1830s it was being used in the manufacture of draperies and coverlets in Pennsylvania as well as East Coast states. 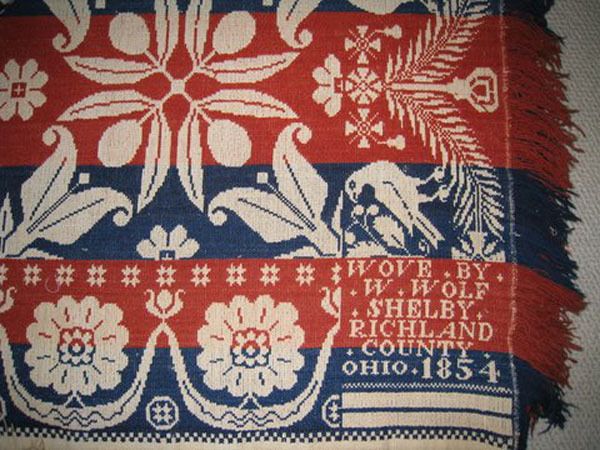 There were coverlets woven in Ohio in the late 1830s and early 1840s as the weavers brought their talent westward. Some of them chose to practice their trade in the Shelby area for a time. The Shelby Museum is extremely fortunate to have some outstanding examples of the coverlet craft in the museum and in the surrounding community. Daniel Wolf was born in Dauphin County, Pa. in 1792 and married Catherine Felty c1814 in Lancaster Co., Pa. Their growing family lived in the Lancaster County area for at least 10 years, but by 1840 they had moved to Franklin Twp., Richland Co., Ohio. The 1840 census reveals that the family then consisted of 4 sons and 1 daughter. By 1850 Daniel and Catherine were still living in Franklin Twp., but only their son Daniel and his developing family were living with them. Their son William born c. 1820 with his wife Rachel and two children were living in Shelby. William Wolf listed his occupation as coverlet weaver. 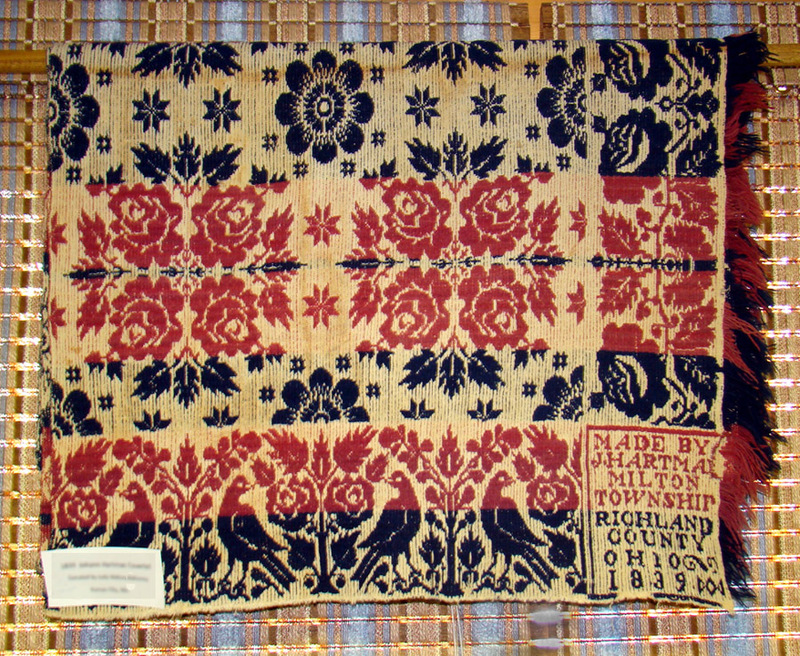 Woven in 1852 at about the time of the birth of William and Rachel's daughter Amanda. 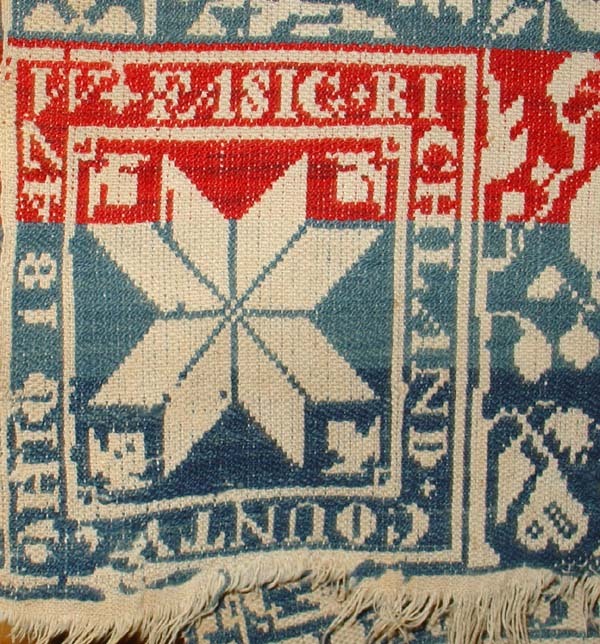 Compare the style and the lettering (the 185 portion of the date) in the corner block with the following coverlet. 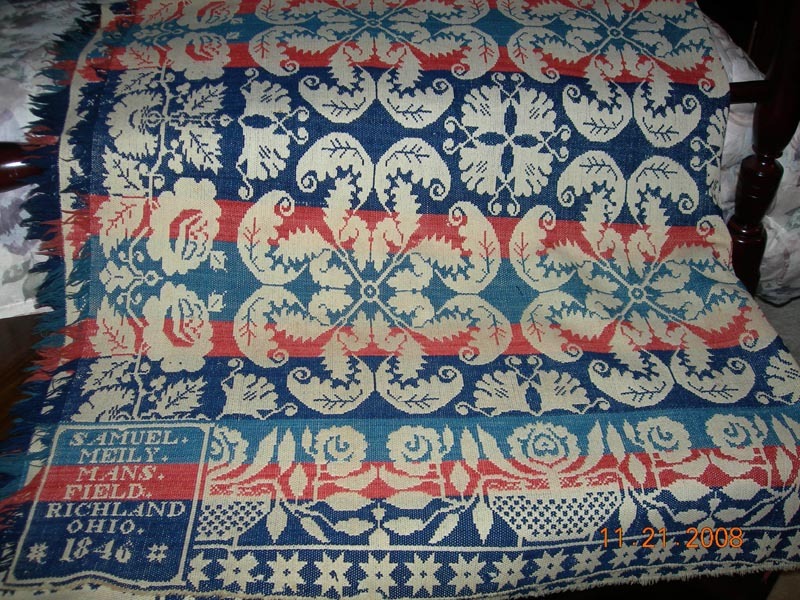 This coverlet was donated to the Shelby Museum by Eleanor Maxwell. It is not known at this time who Elizabeth (the coverlet buyer) might have been. William and his family only stayed in the Shelby area a short time after making this coverlet. By 1856 he was living in Pittsford Twp., Hillsdale County, Michigan. He is listed as a farmer in the 1860 census. It seems to have been rather typical for a younger male to learn the weaving trade while still living at home and continue to practice it for several years after marrying while entering farming. Weaving was an occupation that could be done in the winter when farming activity was less. As years passed and farm and family grew, the time spent weaving frequently diminished. We are extremely fortunate to have the cooperation of many area residents who have volunteered to allow their prized examples of coverlets from this area to be included in our article. Thank you to all who have helped in this project! This is another brightly colored example of William Wolf's craftsmanship. 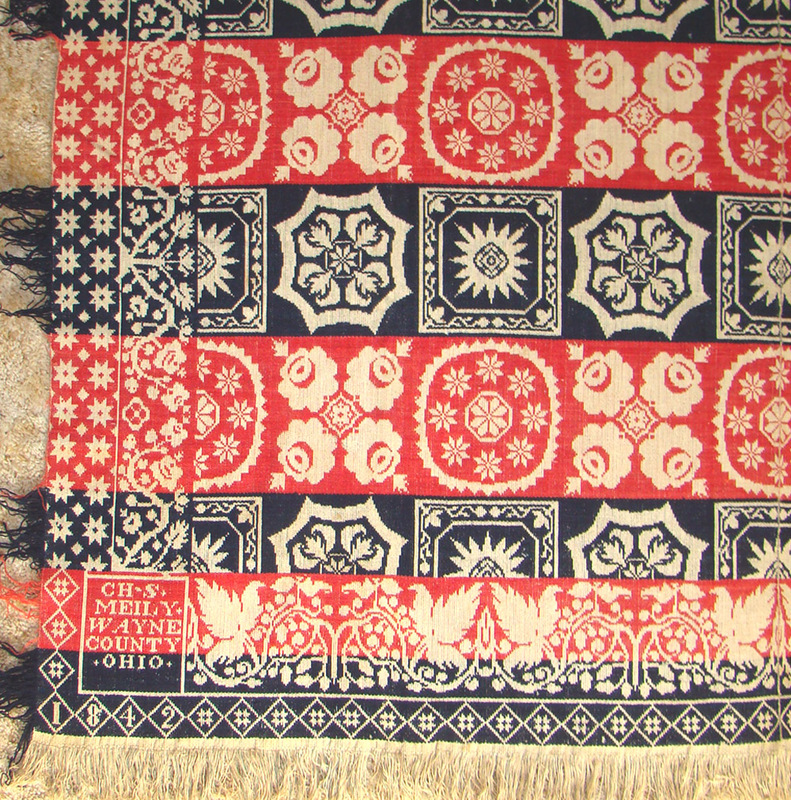 It is not certain how the wool used for the construction of these coverlets was obtained. At one point, the person who requested the coverlet provided the wool and requested the colors to be used. The weaver processed the wool and used his own recipes for it's coloring. As time passed and conditions varied, the weaver may have purchased the processed wool and then dyed it, and in later years the wool in it's final state was purchased by the weaver . The colors used in this design are frequently used in coverlets, but the colors are as vivid and vibrant as the day it was completed. It has been well cared for and was beautifully crafted. William and Rachel raised their family of at least 8 children and continued to farm in the Pittsford Twp., Hillsdale Country, Michigan area. William and Rachel Wolf died there in the latter part of the 1800s. and contacted us and supplied us with the pictures shown below. As the photos show, the coverlet is in wonderful condition. It must have been well stored and lightly used. The colors are still vibrant and the wear appears to be very minimal to non-existant. The reds show even better in this photo of the reverse. What a wonderful find! coverlets history, however she plans on making a permanent place for this piece of Shelby history in her home. Zorada Sheets Bussom. Many will remember the Bussom's store in Shelby. Bussoms live in Thomasville, Georgia and that "local antiques/gift shop" is in Georgia. to find it a new "Shelby home" in Georgia. Congratulations Bussoms for your terrific discovery and thank you so much for sharing your good news with us!! A William Wolf coverlet perhaps commissioned by an early member of the Lantz family in the Shelby area is now in the proud possession of Mary Kuehn of Platte City, Missouri and her sister Mrs. Ruth Lantz of Columbus, Ohio. Mary and Ruth are descendants of the Wolf family and Ruth is related by marriage to one the Lantz families in the Shelby area. The coverlet was discovered in a closet of a Lantz family descendant in the Shelby area. Mary said that Ruth just had the coverlet dry cleaned prior to the picture - taking and it is obviously beautiful. Mary indicates the coverlet colors are navy blue and buff white. Mary and Ruth are grandchildren of Charles Earl and Ottie Rosina Clark Wolf. Charles is one of at least five children of Oliver J. and Alma J. Stevenson Wolf. 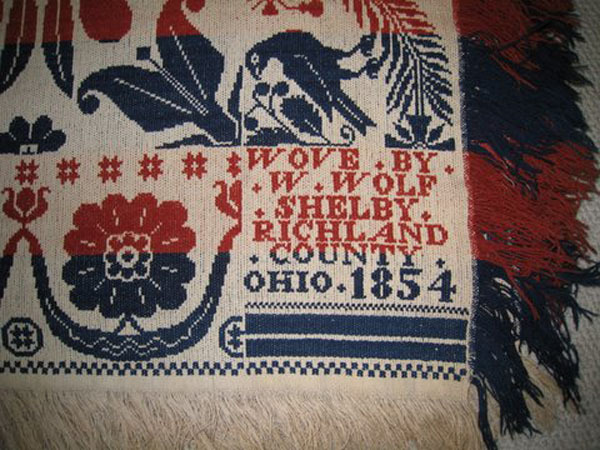 Oliver Wolf was born in 1853 in Blooming Grove, Richland County, Ohio the same year William Wolf was weaving this coverlet, probably in downtown Shelby, Ohio. Oliver's father was Daniel Wolf who married Elizabeth Arnold in November of 1848 in Richland County, Ohio. Daniel Wolf was born c. 1807 in Pennsylvania and Elizabeth Arnold was born c. 1829 in Ohio. The relationship between this Daniel Wolf and the Daniel Wolf and Catherine Felty Wolf family has not yet been defined, however due to the proximity of all these Wolf family members in the Blooming Grove Twp., area in the 1840s and 1850s, it is quite likely there is a close relationship. A search of the Blooming Grove cemetery may provide a few more clues, since Daniel and Elizabeth Wolf continued to stay in the Blooming Grove area. The 1880 census indicates that two of Daniel's sisters are living with Elizabeth Wolf (widowed). This relationship could provide clues to Daniel's parentage. Mary and Ruth would like to determine their Lantz family descendancy and the possible relationship with William Wolf the weaver of their coverlet. The results of this research will hopefully be presented here in the not too distant future. Thank you Mary and Ruth for discovering and sharing your wonderfully preserved William Wolf, Shelby coverlet !! Adam Wolf Jr. was born c. 1852 in Michigan so the family probably moved from the Blooming Grove Twp. area to Maple Grove Twp., Barry County, Michigan sometime between 1850 and 1852. The 1860 census lists Adam's occupation as a farmer. Adam and Mary Ann as well as many of their children lived out their lives in Barry Co., Michigan. 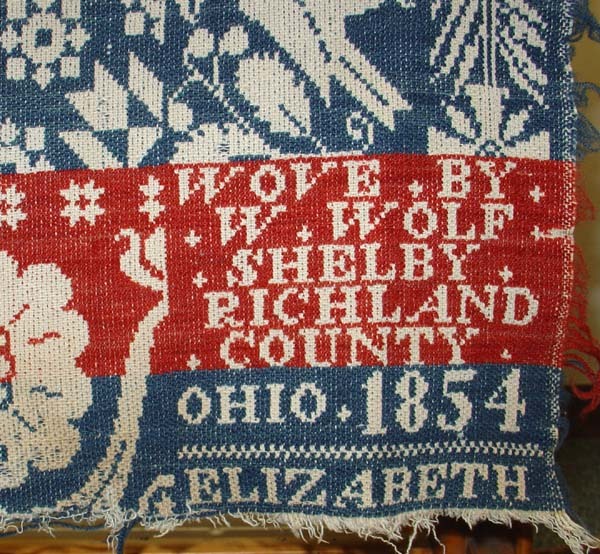 We believe there must be examples of Adam Wolf's coverlets in the Shelby area and will continue to search them out and hopefully add them to this article in the future. We found one. This one has been "used" a lot! But due to its sturdy construction and quality materials, it has weathered the 160 + years of use quite well. The pattern is familiar and the constuction is conventional but the pink color is very striking. A quick review of the 1840 and 1850 census returns from the Blooming Grove Twp., area of Richland County reveals no person named William Dunnen. 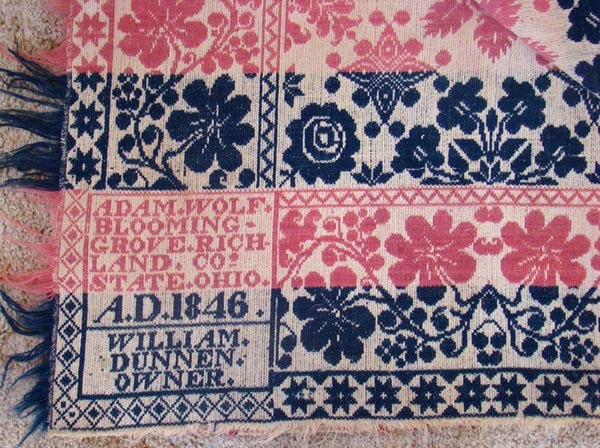 Further research will be done to attempt to identify the original owner of this Adam Wolf coverlet. Any information that you might want to share will be appreciated! Henry Wolf was probably Daniel and Catherine Wolf's youngest son. He was born in August of 1825 in the Harrisburg, Pennsylvania area. In 1847, he married Sophia Zeiters (sister of his brother Adam's wife Mary Ann) here in Richland County. By the time of the 1850 census he and Sophia were living in Cass Twp., with two children. Henry listed his occupation as weaver. 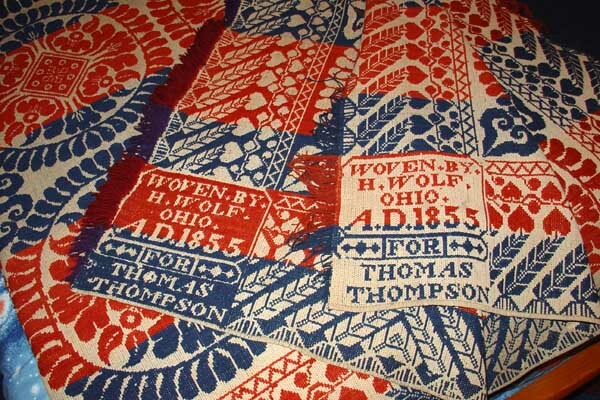 In 1855 Henry wove a coverlet for Thomas Thompson who was a farmer in Blooming Grove Twp. Richland County. As can be seen below, he included Thomas's name in the corner block. Shortly after Thomas Thompson passed away in 1868, his estate was auctioned and two of his coverlets were sold. One sold for $6.00 and another for $7.00. Because of it's beauty and fine workmanship, we prefer to think that this is the one that sold for $7.00. Sometime between 1856 and 1860 Henry and his family moved to Michigan, where he listed his occupation in the census as "farmer". Henry and Sophia raised a family of at least 10 children and continued living in the Pittsford Twp., Hillsdale County, Michigan area until she passed away in 1878 and he in 1898. 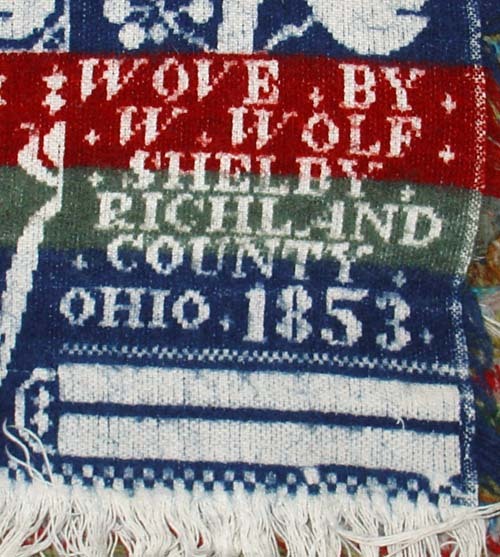 We hope to find additional examples of Henry Wolf's coverlets that were woven here in the Richland County area. he moved after this coverlet was completed. Marlene also wondered if we knew of an "Elizabeth Wentz". She then sent pictures of her Henry Wolfe coverlet. 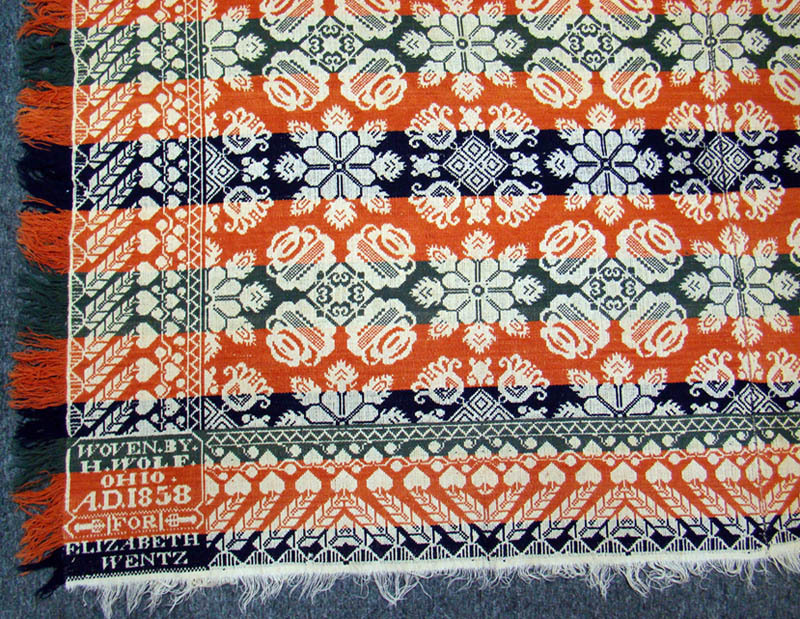 of this 1858 coverlet. 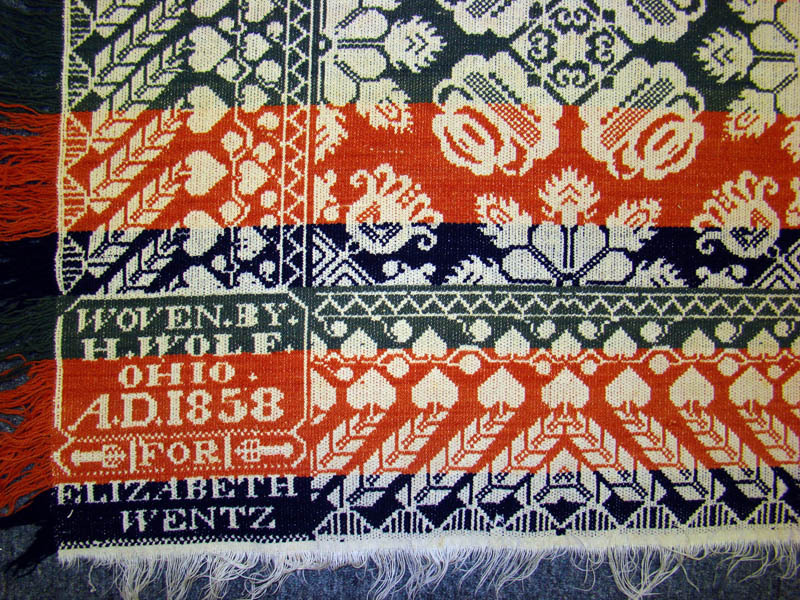 The date of the coverlet was a huge clue to the correct "Elizabeth Wentz." became the Shelby Mutual Insurance Company. Child number seven was Elizabeth Wentz who was born in 1837.
coverlet. Elizabeth Wentz would never marry and this could account for the excellant condition of the coverlet. that Paulina may have kept the coverlet and then passed it along with her other possessions. Cass Twp., Richland County area until 1858, before moving on to Hillsdale County, Michigan. the Wolfe and Wentz families. Thank you, Marlene, for sharing your coverlet with us. The Fasig family is a bit more difficult to research than the Wolf family. Dewalt Fasig was born in 1771 and married Catherine Petri in 1796 in Reading, Pennsylvania. Dewalt and his wife Catherine lived and raised their family in the Lebanon County area of Pennsylvania. There were several families who had weaving occupations or ones that were supporting the weaving trade located in this part of Pennsylvania at this time. In 1830 all their children had left home and they were living alone. DeWalt and Catherine Fasig passed away by the early 1840s and many of the Fasig families from this area of Pennsylvania had begun to move westward. The two children of DeWalt and Catherine of interest to us in this article are Daniel born 1796 and William M. born c. 1801. Daniel and his wife Maria were married in 1816 in Lebanon, Pa. and began to raise their family. Sometime after 1834, the family moved from Lebanon County to Wayne County, Ohio where they were in the 1840 census. Their family consisted of at least 8 children and 6 of their 7 sons were living with them in 1840. One of those sons is Christian born in 1825. In 1846 Christian married Catherine Ellen Fasig, which turned out to be quite significant. Catherine was his cousin, a daughter of William M. Fasig. This relationship is a strong arguement that the coverlet below was woven by William H. Fasig and that he was living in the Richland County area at the time, since this coverlet was woven in 1847 and the marriage of his daughter had occurred just the previous year. William H. Fasig was born in Lebanon County, Pennsylvania and in 1822 he married Elizabeth Hibschman in Lebanon County. Their first child was born in 1823 and the last of at least 11 children was born in 1846, the year of the marriage between their daughter Catherine Ellen and Christian Fasig. William and Elizabeth moved from Pennsylvania to Ohio by 1831, probably to Wayne County where his older brother Daniel settled. At least 5 of their children where born in Ohio over a period of 14 years. 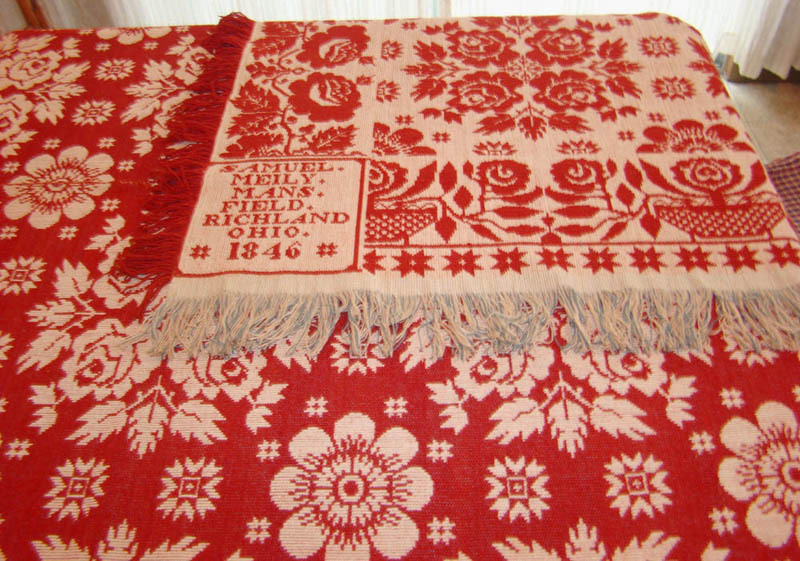 Sometime after the marriage of his daughter Catherine, the completion of this coverlet in 1847, and before 1850, the William Fasig family moved west to Clark County, Illinois. Christian Fasig moved as well since both families were living there by the time of the 1850 census. This 1847 William Fasig coverlet belonged to Cinda Brown Briggs who gave it to her grand daughter Betty Mellick Fischer. It was donated to the Shelby Museum by Phyliss and Don Gates. Like all the other Shelby Museum coverlets, it is on display in the main room of the museum. The 1850 census indicates that William Fasig's occupation was a farmer. Christian Fasig who also lived in Martinsville Twp., Clark County, listed his occupation as weaver. Perhaps he was taught the trade by his father-in-law or maybe it was learned prior to his marriage since he has coverlets attributed to him in Ohio in 1846 and 1847. (2) By 1860 Christian was listed as a farmer and William, living close by, was a bricklayer. 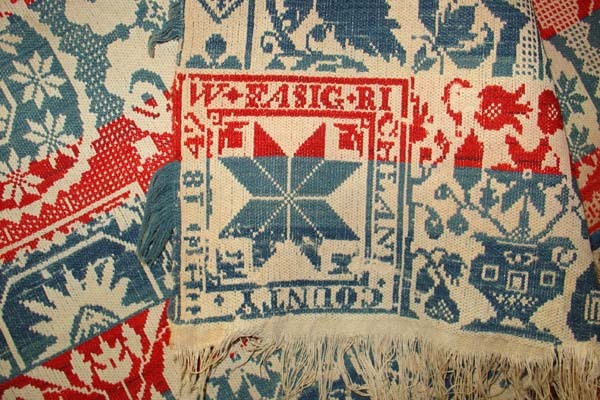 There are existing coverlets that indicate that Christian was weaving in Illinois until the mid - 1850s while William continued to produce them until the mid - 1860s. As they progressed in years, William continued work as a bricklayer, while Christian followed farming. William and his wife died in the early 1880s while Christian died in early 1900 with Catherine living until 1915. They were all residing in the Clark Co., Illinois area. In mid-May, 2017 we received a wonderful surprise email from Judy Derry Mahoney in Mercer Co., Mo. in memory of her uncle Phillip. The coverlet corner block indicates John Hartman's address as Milton Township, Richland County, Ohio. Richland  Ashland County area. All three were members of the Mennonite community. Johann Peter (1772) and Anna Lengen Hartman (c 1776) were both born in Bavaria, Germany. This Hartman family immigrated to America c 1830 and settled in Perry County, Pennsylvania where within a year's time Anna died. Their known children include: Johann Peter, born 1800; Johannes John, born 1807; Johann Heinrich, born 1809; and Agnes, born 1814. Johann Peter Hartman died in Perry County c 1834. The four children moved west to Richland County into an area that in 1846, would become Ashland County, Ohio. In 1836 Johannes John Hartman married Anna Maria Mary Bauer, also born in Bavaria (c1809) and they would be the parents of seven children. In 1839 John and Mary were living in Milton Township, which at the time was a part of Richland County. It was then that Judy Derry Mahoney's coverlet was made, being one of the very earliest currently known to have been produced by any weaver in this area. John still listed his primary occupation as weaver in the 1850 census, however by 1860 he had changed to farming and would continue in that capacity until he passed away in 1881. Mary died in 1858 and they are both buried in the Rickert Cemetery in Ashland County. Judy Mahoney has donated her beautiful Hartman coverlet to the museum and it is the earliest coverlet (by at least three years) that we have. It is a two color coverlet: navy blue and rose colors on a natural background. The edge pattern is a distelfink (goldfinch) and rose. as well as grapevine - with a double rose pattern and clematis in the center. We are certainly pleased to display it for all to see! Further study revealed that the James Theodore Drake family had lived in Savannah, Ohio in 1840 and when there, had a son, James Patrick Drake, born c. 1839. Savannah is only 5 miles from where Johannes John Hartman lived. That might explain how and why the 1839 coverlet was acquired. Then, when the Drake family moved on to Mercer County, the Hartman coverlet traveled along as well. Perhaps this solves the mystery of how this beautiful coverlet became a part of the Judy Derry Mahoney family. 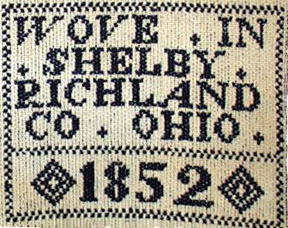 Thank you, Judy, for making this coverlet available to the Shelby Museum and thereby to those who visit our website!!! Meily families were living in the Lebanon and Daulphin County, Pennsylvania areas in the early 1800s and by 1850, there were several Meily family members involved in some aspects of the weaving business. At this time it appears that Emanuel Meily II, aged 45, who listed his occupation as "blue dyer" was the oldest son of Emanuel Meily I, born 1770 - 1780, died sometime after 1840 in Lebanon County, Pennsylvania. One can assume that Emanuel Meily II dyed wool for the "family" weaving business. This "family" could have been the immediate Meily family or could have extended to other related area Meily families. These five comprise the Meily weavers who may have woven coverlets for the Shelby area. Charles was born in Lebanon Twp., Lebanon County, Pennsylvania. Both he and his future wife Mary Anna Michael were born in 1806. They were married c. 1829 in Lebanon Twp., Lebanon County, Pennsylvania. Still living in Lebanon Twp., in 1830, they moved to Ohio sometime between 1832 and 1834 with their oldest child, John Adam Meily, born in November, 1830. 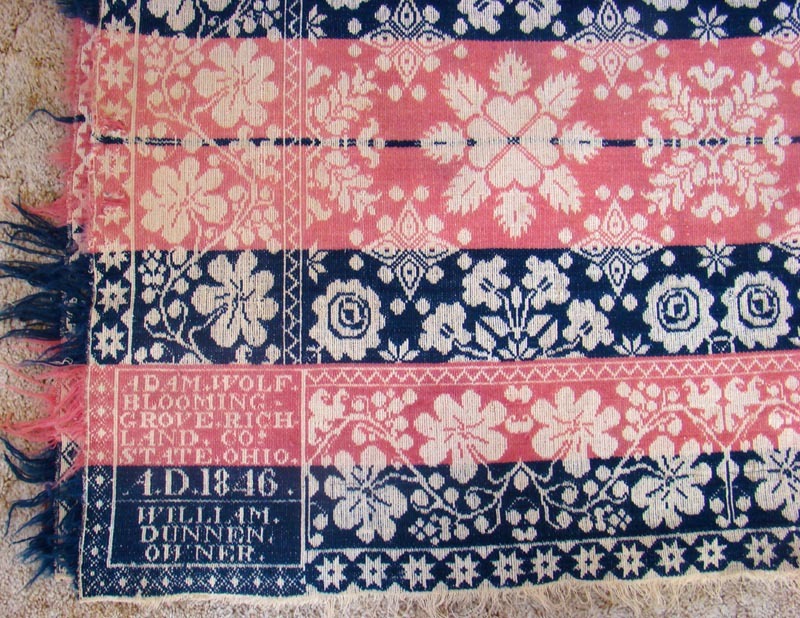 The 1840 census shows the family living in Sugar Creek Twp., Wayne County, Ohio where in 1842, Charles wove the beautiful coverlet shown below. In 1850 they continued their residence in Wayne Co., Ohio and had a family of five children: John Adam, George E., Catherine C., Lydia J., and Mary. Charles listed his occupation as weaver. John Adam listed his trade as shoemaker while George helped with the weaving. Sometime prior to 1854 the family moved to Crawford County, Illinois, where the 1855 Illinois State census revealed John Adam Meily, born 1830, was living in New Hebron. Another record lists his marriage to Catherine A. Griffith, (c. 1853) and the birth of their child Milton B. Meily c. 1854. The 1860 census lists Charles and family ( Mary - aged 17 and Frances - aged 5) living in New Hebron, Crawford Co., Illinois. Charles is still listed as a weaver. Wife Mary Anna is living a few farms away with the Robert Dunlap family. In 1857, son George E. Meily married Leah Reinoehl, daughter Catherine married John Bussard in 1855 and Lydia J. married Joseph H. Vane in 1859. Oldest son John Adam Meily passed away in 1858 leaving his wife Catherine to care for their son Milton. In 1870, Charles (farmer) is living in Honeycreek Twp., Crawford Co., Illinois, with his daughter Lydia J. Vane and her two sons Charles and Henry. Her husband Joseph and her brother George E. Meily were killed in the Civil War in 1863. Their mother Mary Anna had died in 1866. Charles S. Meily died in 1877, there in Crawford Co., Illinois and he and a number of the family are buried in the New Hebron Cemetery. 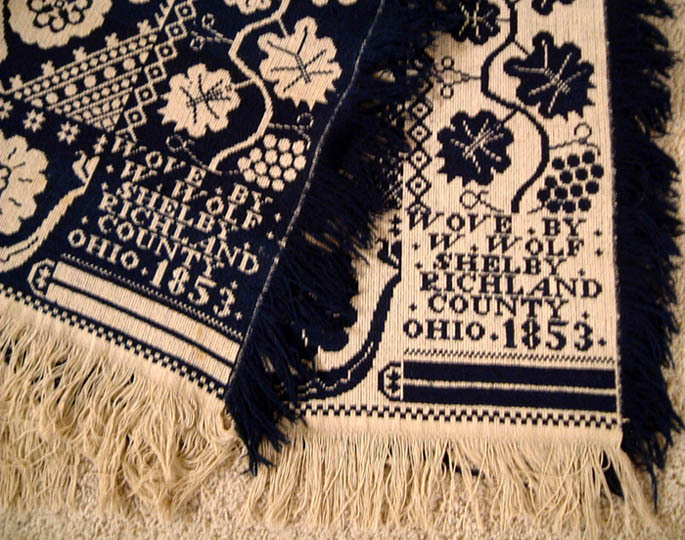 Some Ohio coverlets do not have a date included in the corner block and those woven in Crawford Co., Illinois are generally not dated. for our museum. There was little hesitation on our part - Of course we would ! ! The coverlet arrived shortly thereafter in near-perfect condition. A few worn fringes are the only slight imperfections. It appears that it could have been woven only a short time ago, nothing like the actual 175 years of it's existance since 1842. Museum in his memory by his children, Chris Shepherd and Laura Shepherd. come down through the line of Robert's mother (Tyrannus Goe Shepherd). Solving this mystery and completing the story will be a puzzle for the days ahead. Thank you for your kind donation, Sandy, Chris, and Laura !! Samuel Meily was born c. 1807 in Lebanon County, Pennsylvania. By 1830 he was still living in Lebanon Twp., Lebanon County, Pennsylvania, had married Mary ?, and they had started their family with a child under 5 years of age (probably Sabina). In 1840 they had moved to Mansfield, Richland County, Ohio and their family had grown to 2 boys and 2 girls. 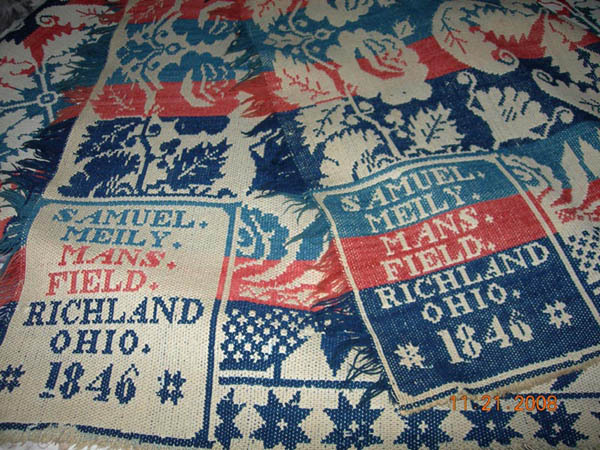 Samuel was still living in the Mansfield area when in 1844, he wove the coverlet that is displayed in our Museum. 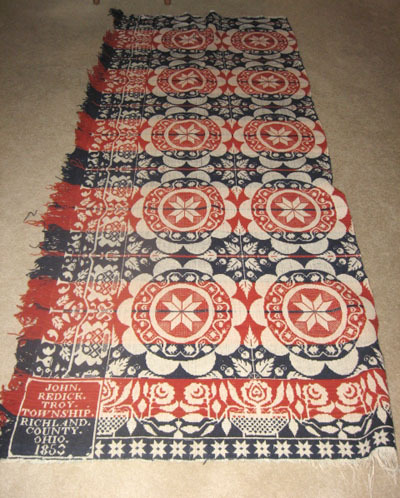 This Samuel Meily coverlet was donated to the Shelby Museum by Sally Kennedy. Not much is known of it's prior history except, as you can see from the photo, it is in beautiful condition with colors that are bright and lively. You will enjoy seeing it! Samuel Meily is listed in the 1850 census (Madison Twp., Richland Co.) as Samuel Meiley, weaver. He and Mary have 5 children living with them and John, 16, is also listed as a weaver. Son John was listed as being born in Ohio, so Samuel and Mary and their family of 4, must have moved from Pennsylvania to Ohio by 1835. 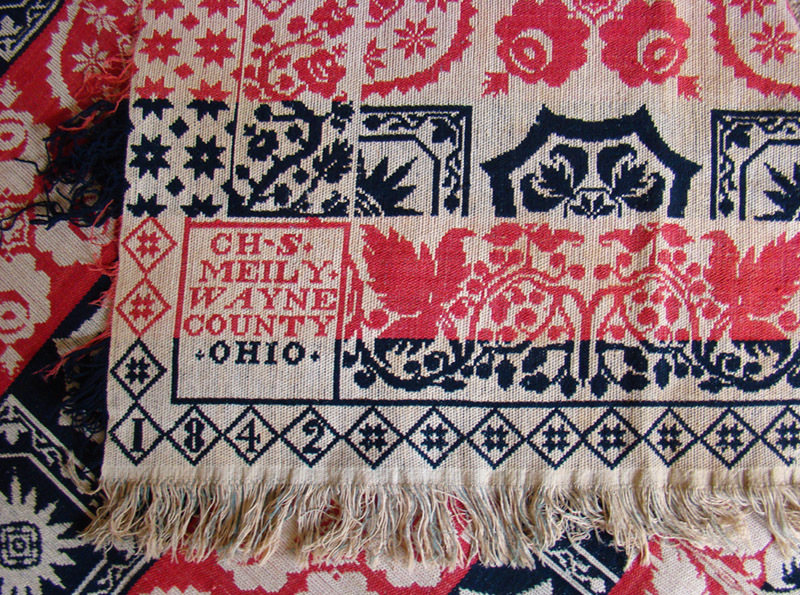 Some coverlets, as early as 1837, are marked: Samuel Meily West Lebanon Wayne County, Ohio. By 1860, Samuel and family were living in Kansas City, Missouri and he listed his occupation as weaver. He must have died sometime between 1860 and the 1870 census but his wife Mary continues to show up in the Kansas City, Missouri censuses through 1880. His sons John, born c. 1835, Samuel Jr., born c. 1839, and Alfred, born c. 1847, are also living in the Kansas City area. More research is required to determine the relationship of the four Meily weavers. Mrs Stidham is the owner of this beautiful Samuel Meily coverlet. The coverlet came to her from her mother's side of her family. Her ancestors were some of the early pioneer families in the Sharon Township area. Her maternal grandparents were William Rhinehart Crall and Narcissa "Nora" Cox. 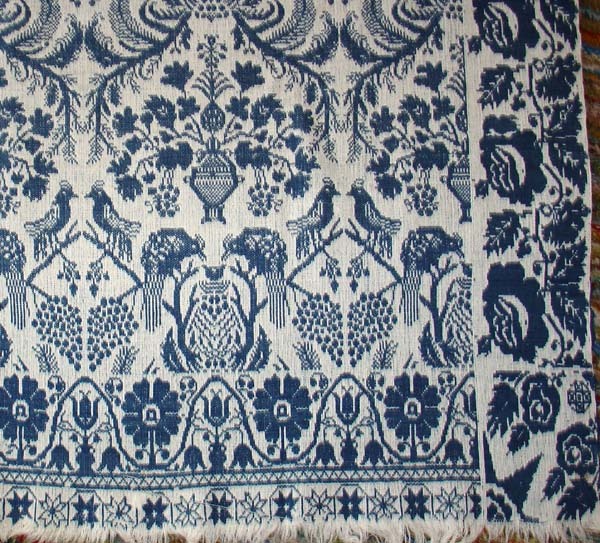 It would have been one of their parents who most probably purchased this 1846 Meily coverlet. William Rhinehart Crall's parents were David and Maria Stentz Crall who were married in April of 1846, the same date as the coverlet. David and older brother Simon came from Pa. to the Sharon Twp. area in 1844. After examining the area he returned to Pa. and the following year he came back with another brother (Henry Jr) as well as his parents Henry S. and Elizabeth Henshaw Crall. Parents and brothers Simon, John, and Henry Jr. settled in Liberty Township, Crawford County, Ohio . In 1850 David and Maria and their two children were living south of Shelby where he was involved in farming. Nora Cox's parents were George and Hannah Funk Cox. Hannah's parents David and Catherine Funk came to Ohio from Pennsylvania prior to 1830. George's parents Joseph and Jane Cox were also in the Sharon Township area (from Wellsburg, Brooke County VA / WVA) by 1830. Hannah married George Cox in 1836, so they (and both of their families) would have had the opportunity to purchase the 1846 coverlet . Both sets of families lived in approximately the same area in Sharon Township, so there would be no obvious reason why the distance to Mansfield (to purchase the coverlet) would favor either the Crall or Cox families. 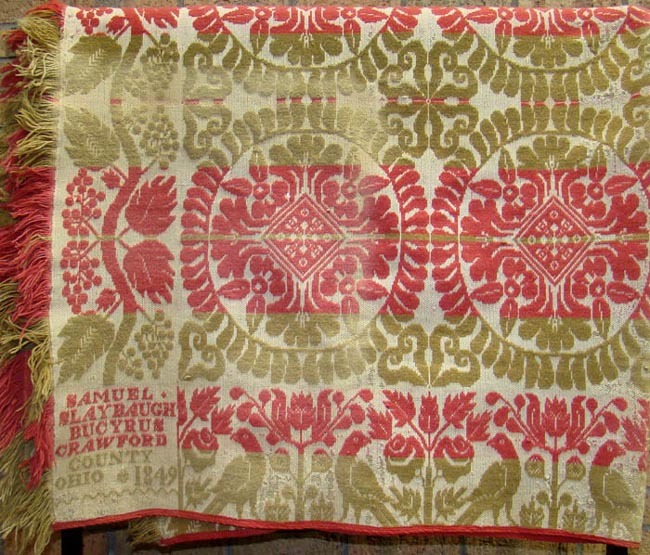 Who purchased the coverlet may always be a mystery, but the 1846 wedding date for David and Maria Crall seems to be a compelling reason for the purchase of a keepsake like this beautiful coverlet. The condition is perfect. No age or wear or fading. Mrs. Stidham says it has probably spent most of it's years in a cedar chest where the conditions for it's preservation have been perfect. It appears just as it must have over 160 years ago. A real treasure! In the years between the 1850 and 1860 censuses, another of Samuel Meily's sons, Samuel born c.1839, must have spent some time in Cedarville, Illnois. There have been coverlets found marked Samuel Meily Jr. Cedarville, Stephenson County, Illinois 1856. 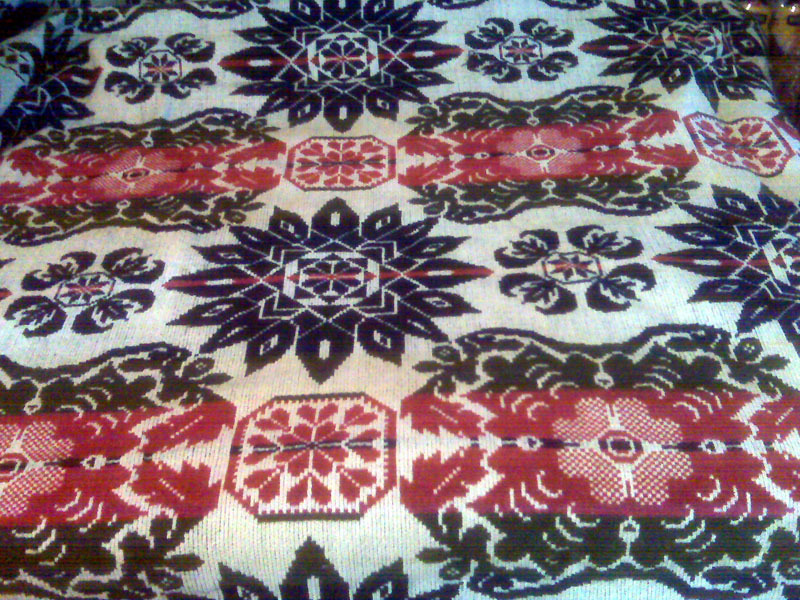 Samuel would have been about 17 when this coverlet was woven. It is quite a distance from his family in Kansas City, so maybe there was a Meily relative living in the Cedarville, Illinois area at that time. Charles S. Meily (see below) moved from Richland County, Ohio to New Hebron, Crawford County, Illinois sometime c. 1855, so that might be a clue to Samuel's move. However, New Hebron is also a long distance from Cedarville, Illinios. Samuel Jr. is again living with his mother in Kansas City, Missouri for the 1860 census. 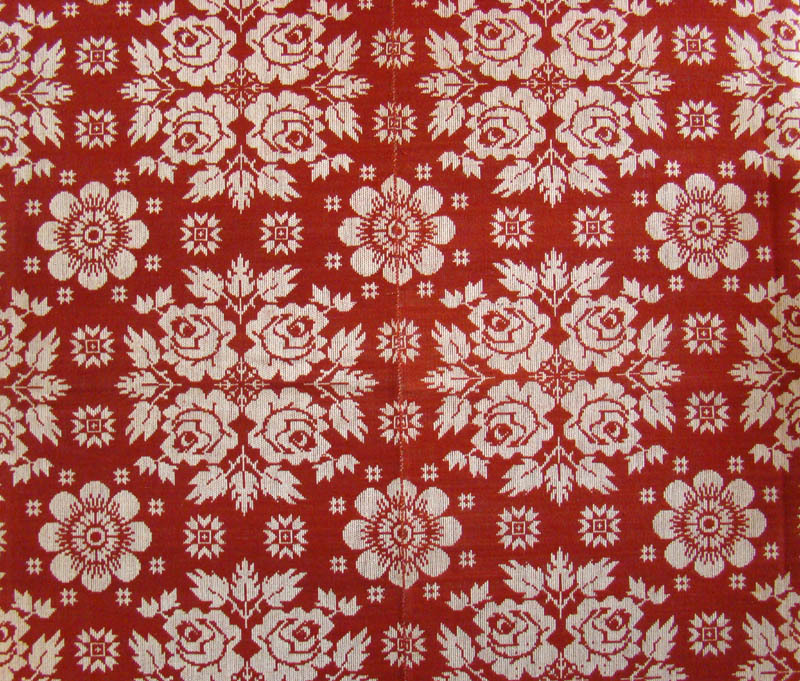 Here's another beautiful 1846 Samuel Meily coverlet. These pictures were provided by a private owner who recently viewed the webpage and saw the other Samuel Meily coverlets and wondered if we would be interested in seeing a Samuel Meily coverlet with a different pattern and yarn colors. Of course we did! The coverlet owner's G. G. Grandfather moved to the Troy Township area (of Richland County) from Pennsylvania in the late 1820s. He came along with his parents who were from New Jersey. Not long after arriving he met and married a lady from Ohio and they made their home in the Ontario, Springfield Township area of Richland County. They began their family with a daughter born c. 1832 and their family was still growing at the time Samuel Meily was making this coverlet. After over 160 years, passing through many generations and traveling a good many miles, this coverlet looks like it was made only a few years ago. Thank you Paul for sharing your coverlet with us! Born c. 1799 in Lebanon County, Pennsylvania, John George married Margaret Stock c. 1828 in Pennsylania. They moved to Ohio sometime after 1842 and before 1844. In 1850, he and Margaret were living in Jackson Twp., Richland County, Ohio with a family of eight children. He listed his occupation as weaver. John Henry Meily was born in Lebanon Twp., Lebanon County, Pennsylvania in 1817. In 1839, he married Catherine Fisher in Richland County, Ohio and they began their family the following year. He and Catherine were living in Mansfield, Ohio in 1840 and continued to live in Richland County until 1846 when they moved to Lima, Ohio. John Henry has coverlets attributed to him during the period 1846 - 1853 (2). In 1860 John was Clerk of Courts in Lima. In 1870 he was listed as a dealer in agriculture implements in Lima. John Henry Meily died in Lima, Ohio in 1884. His wife Catherine was listed living in the area in 1900. We will continue to search for additional examples of coverlets from this prolific group of Meily weavers. John Reddic / Reedick was born about 1814 - 1815 in Hesse Darmstadt, Germany. He was in Ohio in the Richland / Crawford County area by 1840. John's first wife was Elizabeth Warwick who died sometime prior to 1842. In 1844 he married Elizabeth Tawney (Toney) who was probably the widowed mother of his adopted daughter Mary Ann born c. 1838. John and Elizabeth Tawney Redick had at least 4 children. The first two daughters, Sarah and Elizabeth were born in Ohio and the last two children Rachel and Samuel were born in Illinois. He lived in Sandusky Twp. and then Troy Twp., Ohio until probably 1855 when the family moved to Perry County, Ill where Elizabeth died between 1870 and 1880. In 1880 he was living with his youngest daughter Rachel Redick Melvin and her new family. John still still listed his occupation as "weaver" in the census. 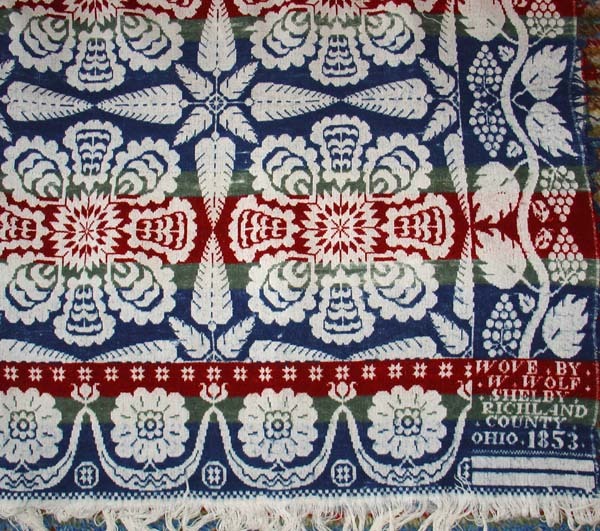 John's known Ohio quilts have been dated from 1850 to 1854. Some labeled "Troy Township" and some labeled "Newcastle, Richland County". New Castle was small burg in Springfield Twp. just east of east of Ontario (part of Ontario today) so it further defines where his shop was probably located. The 1850 census (taken September 2, 1850) shows him in Sandusky Twp., Richland Co., Ohio which would be just west from New Castle and north of the Troy Twp. location, so he stayed in the same general area during his stay in Ohio. In 1850 he had 3 other weavers, John H. Vogstine 36, John Vogstine 20, and George W. Vogstine 18, (possibly Von Stine) living in his household. Also listed in the 1850 census (taken August 21, 1850) in Springfield Twp., Richland County, is George Reddic 63, born in Germany who lists his occupation as "weaver'. George could be considered a candidate for John's father, however George and his wife Elizabeth list John 26 "wagonmaker" and Peter 21 "weaver" as part of their family. Our John Reddic is 36 in the 1850 census and living in Sandusky Twp., so there is not much possibly that our John is George's son. The fact that both George and his son Peter were weavers would certainly indicate there was some relationship to our John. The 1860 census for Springfield Twp reveals a Philip Reddic 73, and Elizabeth Reddic 74, both born in Germany and living in a household with Leonard and Elizabeth Von Stine and their family. There must be a connection with our John Reddic who by this time has moved with his family to Illinois. More research will hopefully reveal John's parentage and clarify these relationships. 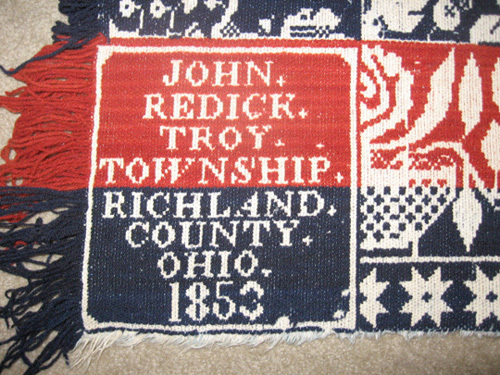 The above John Redick coverlet was most likely woven at John's New Castle, (Ontario) Ohio location. 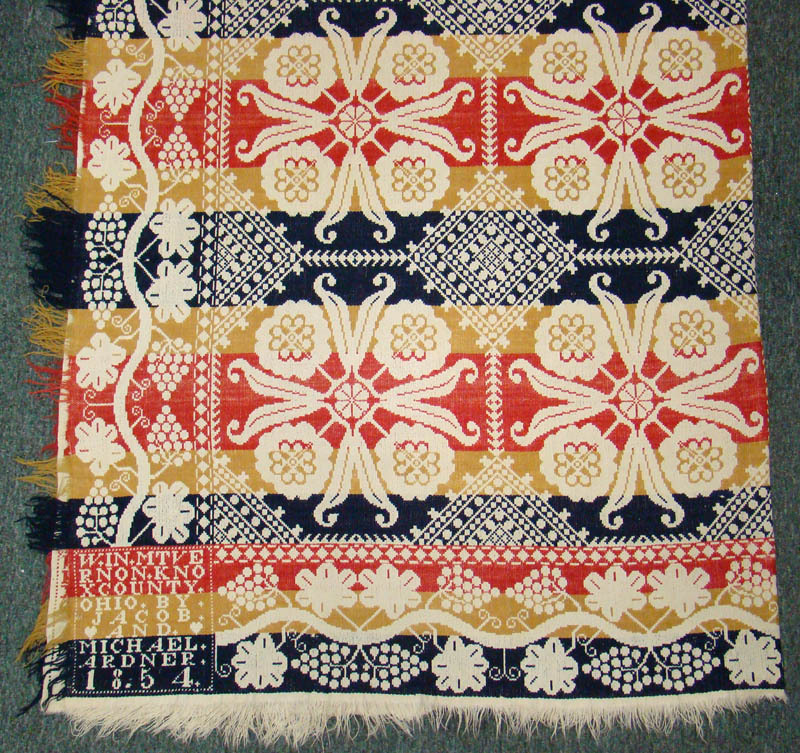 The upper photo shows that this is a normal loom width coverlet. John Redick's coverlets were woven (as were the majority of the earlier coverlets) as two 37 - 44 inch widths and joined to make a full width ( 74 - 88 inch) coverlet. This allowed the loom to be much more transportable for those weavers who tended to move (usually) westward as their base markets became satisfied. There were full width looms as well, however they were more likely employed by those weavers who became long established in their community. The above coverlet is therefore a good example of a 1/2 width coverlet sample. Our thanks go to Charles Luse for providing the photos of this John Redick coverlet. 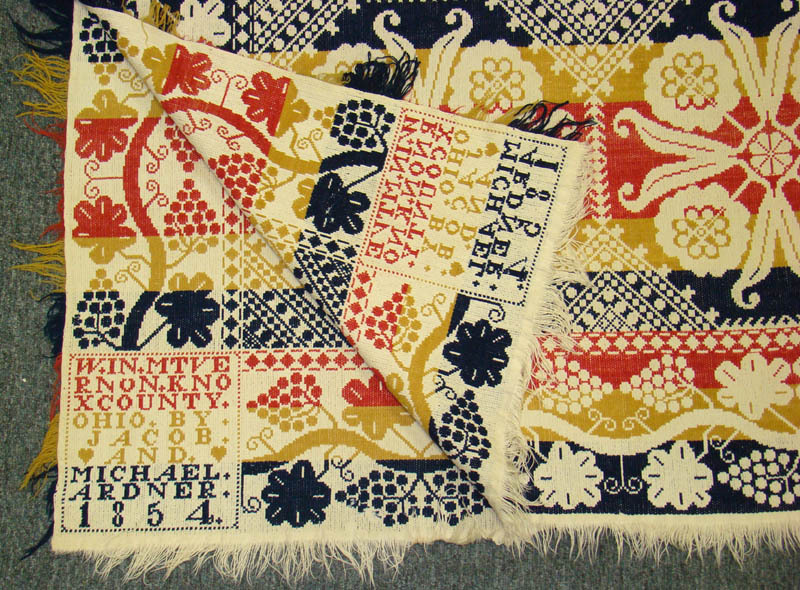 Please contact the museum if you have further information on the John Redick Family and/or John's coverlets. Johan George Schlebach (Slaybaugh) was born 1789 in York Co., Pa. (in the area that would become Menallen Twp., Adams County after 1800). He married Sarah Werner c. 1810 and they began their family that would eventually number eleven children. The family seems to have remained in the Adams County area until the mid 1840s. In the 1850 census we find George Slaybaugh (mason) living in Bucyrus Twp., Crawford County, Ohio with son Joseph (c. weaver) and his family. Also living in the Bucyrus area in 1850 was another son, Samuel Slaybaugh (coverlet weaver) and his family and a third brother, George Henry Slaybaugh who lists his occupation as "tobacconist" living in the same household. Josiah Joseph was born in Adams County, Pa. in 1824. At about age 20, he traveled to Ohio with his family and while in the Stark County , Ohio area he met and married Leah Bushong, daughter of Johannes and Barbara Bushong on August 26, 1846. By 1846 Josiah and his brother Samuel were working in the Bucyrus, Ohio area. They were also probably in business together at about this time since there exists coverlets with corners marked J. and S. Slaybaugh Bucyrus, Crawford Co., Ohio over time period 1846 - 1848. 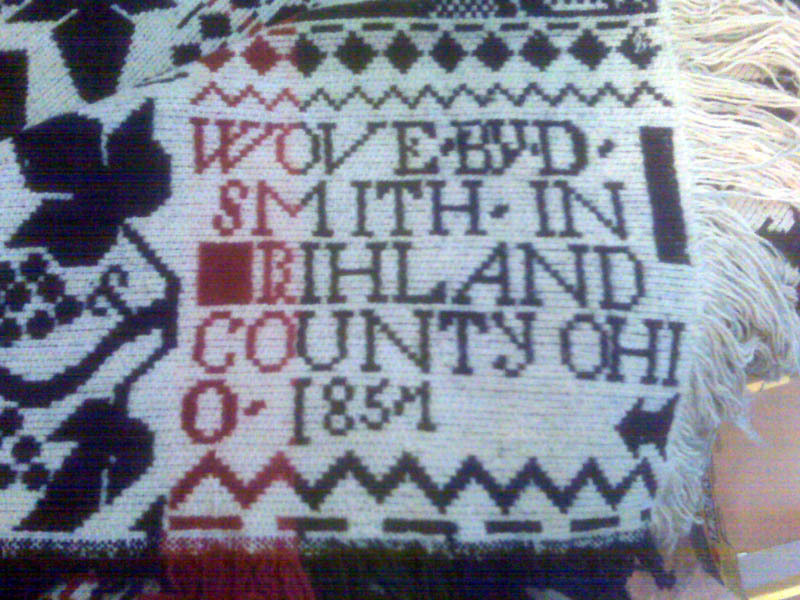 As individual weavers they both produced coverlets extant 1848 marked Bucyrus, Crawford Co., Ohio. 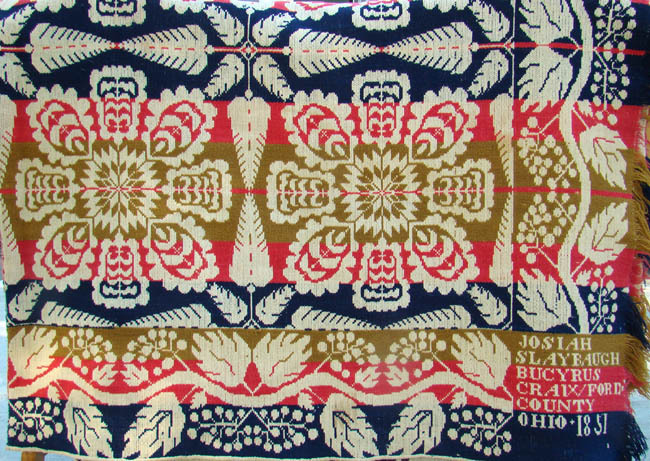 Most all known Slaybaugh coverlets woven as individuals in the Bucyrus area were of the period 1848 to 1851. This Josiah Slaybaugh coverlet was donated to the Shelby Museum by the Peter Webster family of Salt Lake City, Utah. It belonged to Peter's mother Frances Marion Bair Webster. Her parents were Dr. Francis M. and Emma Alta Milburn Bair. Her paternal grandparents were Aaron Josiah and Barbara Ella Winstead Bair who lived much of their lives in Mercer Co., Ohio. Her maternal grandparents were from Maryland and will probably not be a factor in our quest. We are currently trying to determine the path of Josiah Slaybaugh's 1851 Bucyrus. 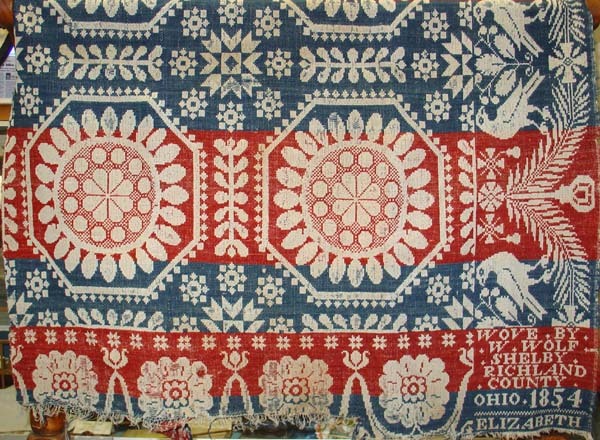 Ohio coverlet to Peter Webster's mother. It has been beautifully preserved all these 157 years. 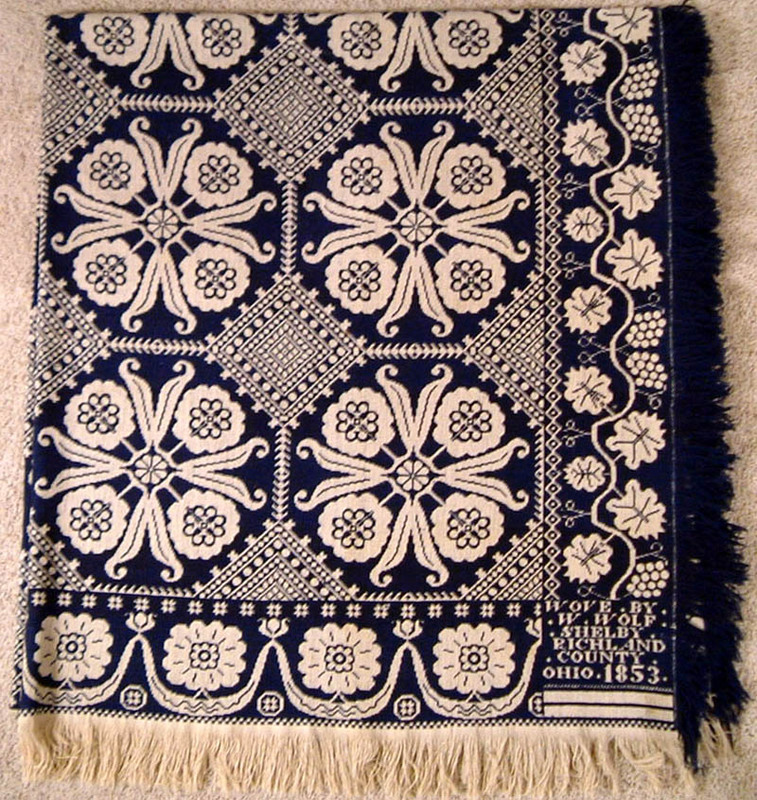 typical use for a coverlet and many of those donated were said to have been used in just this manner. Not long after this coverlet was completed Josiah Slaybaugh began considering a move further westward. Their youngest child Emerancy (Emma) was born in December 1848 and their next a son Silas Burt was born Nov. 1851. The second son Edmund was born in early February 1854 and he was born in Indiana. 1860 finds Josiah's family of 5 children living in Van Buren Township, Kosciuosko County, Indiana. It is generally assumed that the reason for moving westward was the market for coverlets and other woven goods began to get saturated and other weavers moved into the area making additional sales more difficult. Josiah was doing well in his business and when he moved to Indiana he purchased farm land that he would use to supplement his weaving income. As time passed the records reveal he continued to prosper in Indiana. One reason is the quality of his work. He chose to make his colors rich and bright and his designs were very popular with the Pennsylvania - German population. He continued weaving carpets and coverlets to a later time than many of his competitors. The hand made coverlets business was nearly over after the Civil War (Josiah was a volunteer in the Civil War) and yet he continued to sell his coverlets until the late 1870s. The possibility of moving further west may have been the reason that Josiah and family were in Caldwell Co., Missouri in 1870; however, he soon returned to his Kosciuosko County in Indiana. Josiah's wife Leah passed away in 1875 and he remarried a couple years later to Mary Ann Stromback who was much younger than he. They had 2 children Clara and John. In 1880 he listed his occupation as carpet weaver. The 1900 census for Turkey Creek Twp., Kosciuosko County, lists his occupation as "landlord". Over the years in Indiana, Josiah wove both Kosciuosko County and Elkhart County into the corner blocks of his coverlets. Josiah Slaybaugh passed away in 1904 at the age of 80 years. Samuel was born in Adams Co., Pa. in 1819 and he appears to be the first of the Johan George Slaybaugh family to move to Ohio. He married Catherine Foltz c. 1841 and their first child George H. Slaybaugh was born somewhere in Ohio in 1842. Samuel was living in Bucyrus Twp., Crawford Co., Ohio in 1850 with his wife and 5 children as well as his older brother George the "tobacconist" and Lewis Fogle (40) "weaver" and William Slaybaugh (14) who was probably the youngest child in the Johan George Slaybaugh family. 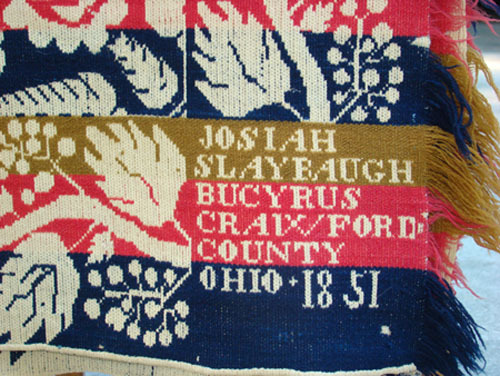 The partnership of Samuel and Josiah Slaybaugh (J. and L. Slaybaugh Bucyrus Crawford County Ohio) existed in Bucyrus, Ohio at least during the period 1846 to 1848. After that time it appears that the two brothers may have separated business wise. They began in 1848 producing coverlets with their own individual names in the corner block. 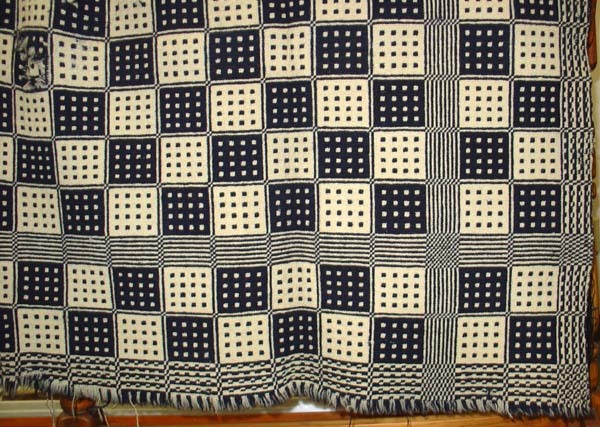 This Samuel Slaybaugh coverlet from the Crestline, Ohio Shunk Museum is an example of one produced after the brother's partnership was probably dissolved. It makes use of the bird & bush as well as the vine & grape border with a medallion design pattern. 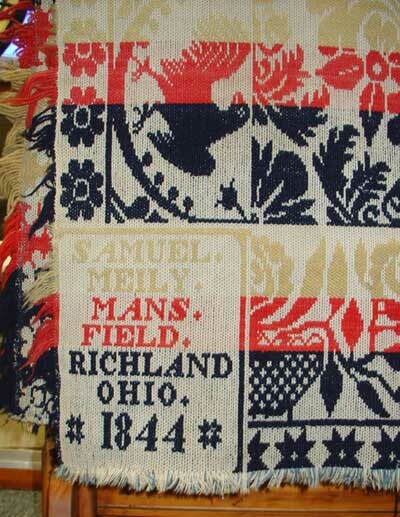 Based on the known examples (1848 - 1849) Samuel may have quite weaving prior to Josiah's move to Indiana. He is shown living in Dallas Twp., Crawford County, Ohio in 1860 and lists his occupation as "farmer". Samuel's son James E. Slaybaugh was born in Crawford County in 1861 and sometime after that the family moved to Osceola Twp., Osceola County, Michigan where they were shown on the 1870 census. Samuel was listed as a "farmer". In 1900 Samuel listed himself as a "retired farmer". Samuel and wife Catherine lived out their lives in Osceola County, Michigan with Samuel passing away in 1905. Jacob Artner Sr. born c. 1782 in Germany listed his occupation as "weaver". Jacob Jr. was listed as a "weaver". Michael is listed as "laborer". as the following example shows. With the exception of a bit of wear on the fringes, this three color design is a beautifully preserved burst of brightness that would lighten any room. The Artner family continued to reside in Mt. Vernon, Ohio and in the 1860 census brothers Jacob and Michael (Michel) surname was listed as "Adams". Jacob's occupation was "saloon" and Michel was a "weaver". and would be very interested in any family information or additional examples of this families coverlets. Sue Neff from the state of Washington wrote about a coverlet that she recently inherited from her mother-in-law. There is little known about the immediate history of the coverlet. It had been stored in a wooden chest and information about how the family came to acquire the coverlet seems to have been lost. Sue is a teacher and has a desire to know more about her coverlet and she sent couple of photos to whet our interest. We found Daniel D. Smith in the 1850 Federal Census living near Butler (then Independence) in Worthington Twp., Richland County, Ohio (roughly 20 miles southeast of Shelby). He lists his occupation as "weaver". The corner block is a bit unclear as to when the coverlet was woven. It can be assumed to read "1857", since "1851" and "1854" can probably be ruled out. Based on the entry position in the 1850 census and those families that surround this Smith family in the census listing, Daniel probably lived in section 14 or 15 in Worthington Twp. while making this coverlet. Family census information indicates that the first of their listed children, Laome, was born c. 1835 in Pennsylvania. The second child, Elias, was born c. 1837 in Ohio. At least another seven children were to follow, the last being Lucinda born c. 1853 in Ohio. Daniel and wife Polly were born c. 1809 in Pennsylvania. With the exception of knowing that the family probably moved from Pennsylvania to Ohio c. 1836, nothing has been discovered of Daniel and his wife and family prior to the 1850 census entry. Daniel didn't linger in Ohio long after weaving this coverlet. The 1860 census finds the family in Elkhart Twp., Elkhart Conuty, Indiana where Daniel lists his occupation as "farmer". The 1870 census finds the family living in Lake Twp., Allen County, Indiana where Daniel continues to list his occupation as "farmer". In another ten years they have moved to Ft. Wayne, Allen County, Indiana with son Jeremiah living with them. Jeremiah is noted to be suffering from consumption and Daniel is listed as a "laborer." Nothing is found in the 1900 census of Daniel and wife Mary "Polly" and so it can be assumed because of their advanced age, they passed away prior to the 1900 census. No trace has yet been found of any of the nine Smith children after the 1880 census. It appears from the information "discovered" at this time, that Daniel's coverlet weaving was a short-lived occupation. It was not unusual that weaving supplemented income until a more consistant means was established and that probably happened when Daniel began farming in Indiana. It would not be surprising however to find that additional coverlets were woven with corner blocks showing continued weaving for a few years in Indiana. Sue would like to know how this coverlet came to be in her husband's parent's (Cliff and Margaret Neff) possession. Cliff and Margaret had been living in California. After Cliff passed away, Margaret Neff moved to Washington State to be with Sue and the coverlet was found in a box. What could be the relationship between Clifford Neff and Daniel Smith weaving in 1857 in Worthington Twp., Richland County, Ohio? Sue would love to know! This coverlet with it's beautiful colors and design is certainly one that Sue Neff and her family should cherish! Thank you for sharing it with us! If anyone has information on this Smith family or a Daniel Smith coverlet, please contact us. 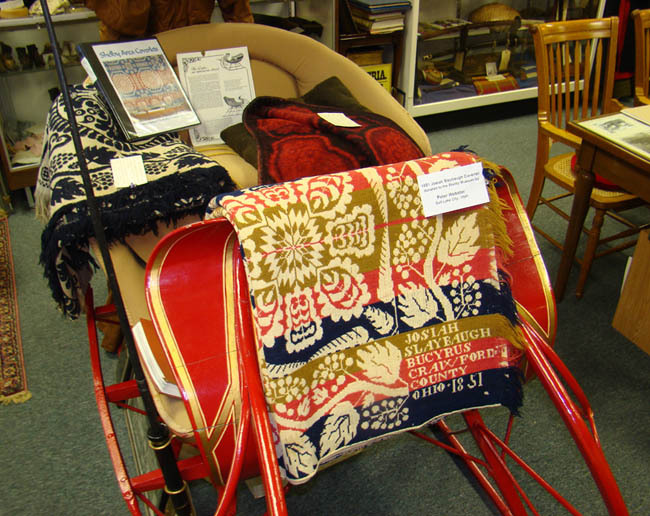 This coverlet was donated to the Shelby Museum by Mrs. Howard Sotzen for George, Harry, Walter, Howard & Bertha Sotzen. It was used in the 1840s as a carriage robe - Henry and Lavinia Sotzen. 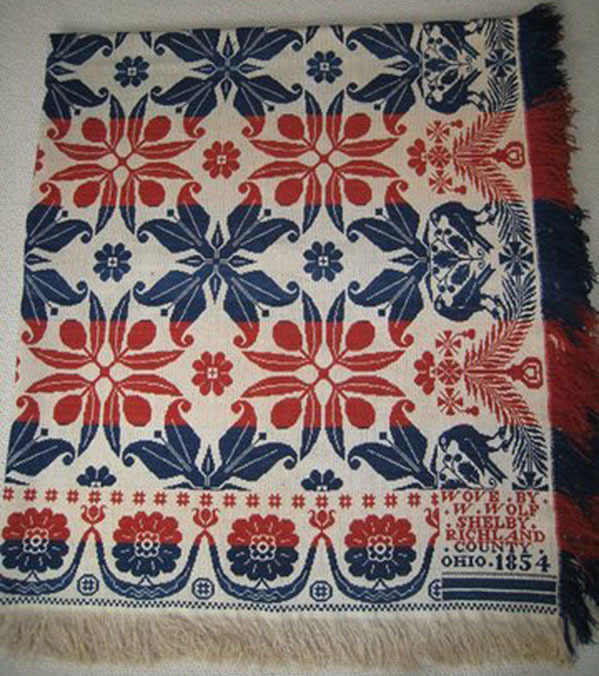 If anyone has a coverlet with a similar design please contact the Shelby Museum. 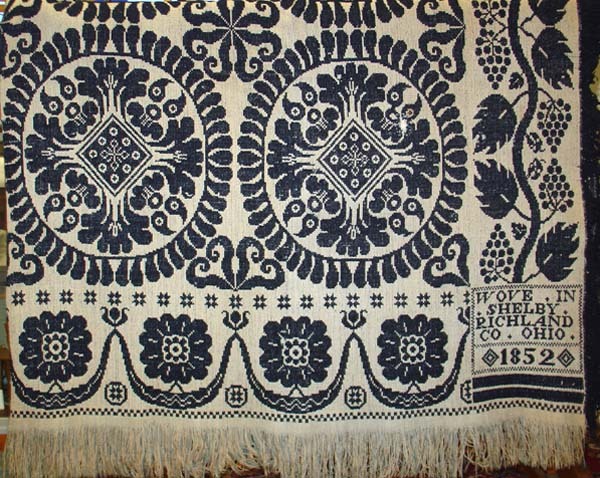 Very little is known of the history of this coverlet, except that it is very likely from the Shelby area since it has been in the possesion of a long standing Shelby family for several generations. It is beautiful and in wonderful condition. Please contact us if you have seen a similar pattern. James Cole, born 1803 in Washington County, Pa., married Eleanor Moore, June 5, 1832 in Crawford County, Ohio. In 1840, the James Cole family was living in Vernon Twp., then Richland County / now Crawford County, Ohio. James was listed as a farmer in the 1850 census (in Vernon Twp., Crawford Co., Ohio)., however there are coverlets extant that show dates of 1844 - 1859 with the location shown as - DeKalb (Vernon Twp., Crawford Co., Ohio). By 1860 the family had moved to Eden Twp.,Wyandot County, Ohio, where James was again listed as a farmer. He and wife Eleanor died there in the early 1880s. Augustus J. T. Long(e), born 1800 in Sachsen, Germany, was married three times. His first wife Rosina, and four of their children came to the United States in 1837. Rosina died shortly after their arrival. Augustus married his second wife Caroline, sometime 1838 - 1841 in Pennsylvania and they would have four children. The 1850 census lists the Longe family living in Sandusky Twp., Crawford County, Ohio with Augustus' occupation listed as weaver. In 1855 he purchased a lot in downtown Shelby, where he ran a woolen mill. Augustus died in 1873 and he and his second and third wife (Esther Becker) are probably buried at the Swale Cemetery in Cranberry Twp., Crawford County, Ohio. For further information on this family see the "Eary Shelby Photographer " section. Charles Wiggins, born c. 1814 in New Jersey, married Margaret Champion, December 1839. He is listed in the 1840 census living in Vernon Twp., Richland Co., (now Crawford Co.) Ohio and is credited with coverlets displaying "DeKalb, Richland County, Ohio". By the time of the 1850 census he was living in Ridgefield Twp., (probably Monroeville), Huron Co., Ohio. In 1860 the Wiggins family was living in Tippecanoe Twp., Kosciusko Co., IN. where Charles was farming. (1) James Essinger Jacquard's Web - Oxford University Press - Oxford, Great Britain - 2004. 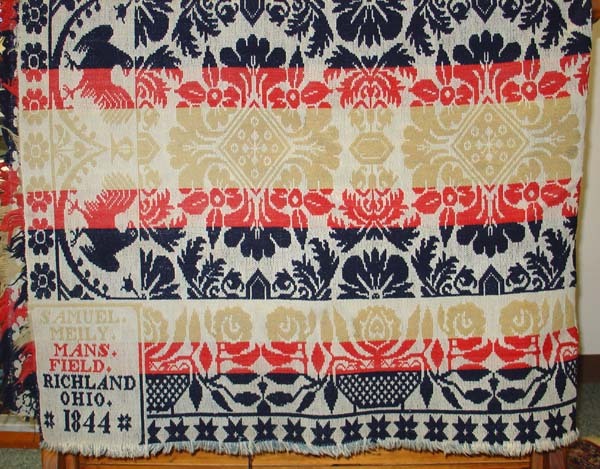 (2) Clarita S. Anderson American Coverlets and Their Weavers - Ohio University Press - Athens, Ohio - 2002. Copyright &COPY; 2000 - 2019 - The Shelby Musuem Of History, Inc.